First performed in London over a decade ago, this David Hare play shows the downfall of Oscar Wilde; Act I is set in a London hotel room during the hours before his arrest and Act II is set in Naples shortly after his release from prison. In the original production, the two halves did not gel and it was difficult to engage with the play or to understand its point. Liam Neeson played Wilde then and had the Irish accent right, but, with the benefit of hindsight, he may have got just about everything else wrong. 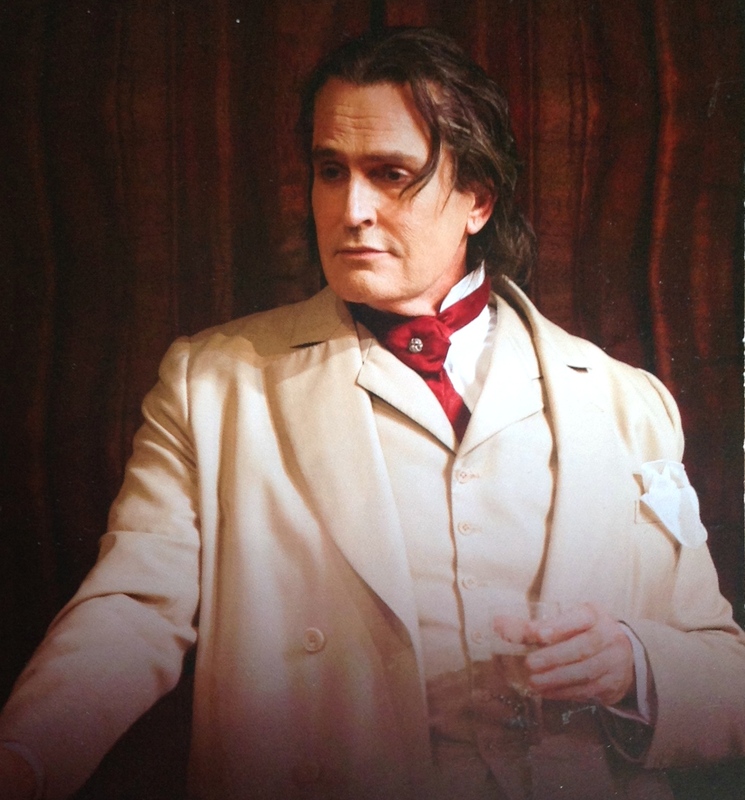 In this production, Rupert Everett as Wilde doesn’t bother with the accent but, in every important respect, he is magnificent, a wounded beast still spitting out witticisms but gradually sinking to the defeat that he knows is inevitable. It is a towering performance and it gives the play a depth and meaning that eluded it before. Freddie Fox and Cal Macaninch also give superb performances as Wilde’s current and former lovers, protagonists urging him to take different paths. A play that was previously very easy to forget now turns out to be a revelation. Describing herself as a third-gendered fallen Catholic, La JohnJoseph here performs her own autobiographical near-monologue (albeit with two supporting performances) interspersed with a few melancholic songs. Born on the day of Pope Jean Paul II’s visit to Liverpool, she tells of her life as a boy and adolescence in that city and then the discovery of her spiritual home in New York. Living with her mother and several step-fathers and indoctrinated by a faith out of sync with her inner self, her life was that of an outsider struggling to find her place in the World. Essentially, this show is a display of defiance combined with a plea for tolerance and acceptance. The story is not punctuated by particularly dramatic incidents, pivotal events or even anecdotes that are more than mildly amusing, it is simply a statement of who the writer/performer is and what made her so. And this is the main problem, because there is nothing new on offer. 50 years ago, Quentin Crisp, for example, could have startled us all with similar material, but the World (or at least the Western World) has now moved on and has already embraced the messages contained here. If this show seems dated, it is for all the right reasons. In view of these reservations about the material, the show stands or falls as an entertainment on La JohnJoseph’s performance. On a set that looks like a second hand furniture showroom, littered with bric-a-brac, she talks, sings, strips, observes and philosophises. She is not a terrific singer, her voice grates but she can sell a song. And she is not a terrific raconteuse, but she has charisma which, although faltering at the start, grows as the show progresses. Her story is about overcoming adversity and, so art imitates life and she just about wins over the audience. Just. Not for the faint hearted nor possibly for Shakespeare traditionalists, this is a full on assault on the senses that barely lets up from start to finish. Performed in the round on a set that looks vaguely like a disused Glasgow warehouse, lights flash and thunderclaps echo, blood drenches the characters and covers the floor of the stage; there would be more peace and love at a Celtic/Rangers match. It is a bleak, dystopian vison that is not time specific, nor, despite a predominance of Scottish accents, is it place specific. 11th or 22nd century, Scotland or Syria, the human cost of tyrany is the same. James McAvoy plays Macbeth like a hyperactive brat, but is very strong in the second half when insanity begins to set in and he comes to realise the full cost of his murderous deeds. Claire Foy is a Lady Macbeth stripped of all regality, earthy and manipulative. There are many chilling scenes that will live long in the memory; in particular, the murder of MacDuff’s family is worthy of Hitchcock. In all, a striking interpretation of the play, but there is nothing wrong with exploring different takes on a classic provided the text is well served by them and they add clarity to the core themes. This production achieves those objectives emphatically. Seen in preview, so still a little rough around the edges, this new musical tells the true story of the rise and fall of William Haines, a Hollywood star of the 1920s/30s whose private life failed to meet the expectations of the studios and particularly those of Louis B Mayer. This is a low budget, small scale effort, but it is packed with interesting ideas and winning performances. The three leads, Dylan Turner, Bradley Clarkson and Faye Tozer (as Marion Davies, girlfriend of William Randolph Hurst) all bring their characters touchingly to life, Mike McShane is an ogreish Mayer and Kay Murphy gives a knockout cameo as Pola Negri. The dialogue is peppered with bitchy showbiz one-liners and there are also some clever lyrics and melodic tunes, although occasionally the songs do not seem to fit in comfortably with the narrative. The story is told in flashback, an unnecessary device that gives the show a slow start, interrupts its flow and leads to a very flat ending. Overall it is an entertaining show which, with a little tidying up, could well improve considerably once it get fully into its stride. In the list of all-time great musical comedies, this comes pretty near the top and inevitably it reappears in London every decade or so. However it is hard to imagine that it has ever been done better than in this wonderful production directed by Trevor Nunn. In an impeccable cast, Hannah Waddingham is outstanding as “the shrew”‘ spitting out “I Hate Men” with real venom, Alex Bourne is excellent as her ex-husband, Holly Dale Spencer makes a delightful dim-witted starlet, partnered by Adam Garcia who “can’t behave” but dances like a dream. In support, David Burt and Clive Rowe stop the show with “Brush Up Your Shakespeare” and Jason Pennycooke opens Act II with “Too Darn Hot”‘ leading a spectacular song and dance routine that brings the audience to its feet. Cole Porter’s glorious songs are too many to mention and the book is bubbling with wit. Brisk direction, dazzling choreography, there is absolutely nothing to fault. Blissful! Borrowing from football, this could be described as a play of two halves. A satire on German society and the military, set in 1910, it centres on Wilhelm Voigt (Antony Sher in top form), a petty thief just released from jail and struggling to cut through layers of senseless bureaucracy. The first half is vaguely Brechtian with dashes of comedy, superbly staged but somewhat stodgy and it climaxes with a funeral. However, it is necessary to sit through it in order to fully appreciate all the gags that are to follow and doing so gives the added advantage of lowering expectations, so that the second half comes as a complete surprise. Shortly after the interval, the action moves to a public toilet and what follows is around 40 minutes of sublime comedy, as Voigt assumes the identity of a captain and takes command of a unit which he leads to reek havoc in Kopenick Town Hall. We are treated to an explosion of verbal and visual gags, utter lunacy that plays like a cross between “The Goon Show” and the Marx Brothers. Who ever said that the Germans have no sense of humour? It reaches the heights of hilarity and Sher brilliance. At the end. all the audience can do is stagger from the theatre, still aching from laughter and pitying the poor souls who decided to leave at the interval. Jerry Herman clearly has a liking for formidable middle-aged ladies. Having struck gold with Hello Dolly and Mame, he chose to adapt The Madwoman of Chaillot, a play by Jean Girardoux and this musical is the result. But sadly, the hat trick of hits eluded him when it opened on Broadway in 1969 and only now is it getting its first UK staging. So the key question was whether this is a forgotten treasure from a golden age of Broadway or was there a very good reason for its long spell in obscurity? The “madwoman” is Countess Aurelia, played here by Betty Buckley, who marshals a group of her equally eccentric friends to thwart a plot by business moguls to turn the Paris of 1945 into an oil field. It is described as “a musical fable”, making it clear at the outset that Dear World will have very little foundation in the real world and, accordingly, the charming sets, designed by Matt Kinley, conjure up familiar romanticised Parisian images. Even so, amidst all the whimsy, there is satire of corporate greed and environmental ruin that is even more topical now than when the show was written It is interesting that Angela Lansbury, who played the lead originally, has been quoted as partly blaming the show’s failure on the size of the theatre, feeling that the staging needed intimacy and charm. No such excuses can be offered here, as the theatre is both small enough to allow intimacy and large enough to have proper sets and choreography. Yet this is still not quite the lost gem that we hoped for. It is all very uneven, at its best rousing, but at its worst plodding. The title song and One Person are catchy anthems typical of Herman, and most of the comedy numbers work very well, but some other songs, particularly in Act I, are riddled with cliches and instantly forgettable. Buckley has got what it takes to carry a show like this and she does so with aplomb. Paul Nicholas clearly enjoys himself leading the support and Ayman Safiah is very affecting, dancing and miming as the Mute. Katy Treharne has a delightful soprano voice but she and Stewart Matthew Price are given very little opportunity to make a lasting impact as the young lovers. As two other “mad” ladies, Rebecca Lock and Annabel Leventon are highly amusing in their routines with Buckley, whilst Peter Land, Jack Rebaldi and Robert Meadmore playing the moguls, relish the cynical lyrics of their songs together. In view of her background as a choreographer, it is a little disappointing that the director does not include more dance and, generally, that she fails to liven things up during some dull patches between songs. But leaving aside the many quibbles, there is still a great deal to enjoy and it should not have taken over 40 years to get this show to these shores.